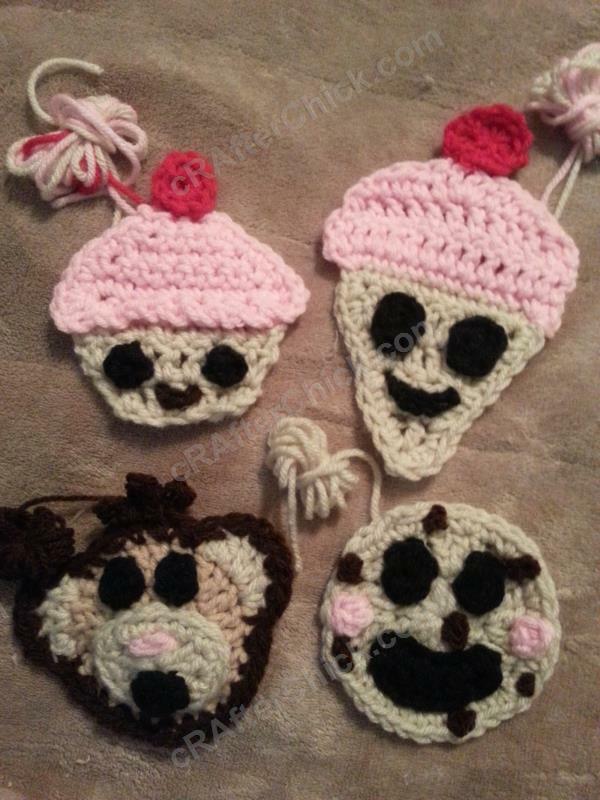 During a day of boredom and not wanting to do any big projects I decided to try making a few chibi looking fun sweets to use as appliques for plain beanies etc. So my little happy cookie friend was born. I ended up making a cute icecream cone and cupcake to go along with him as well. This was an easy and short project that even beginners can make up in one sitting. If you know how to work in the round, you will be able to make this cute little guy. Here is a picture below of the little set all together plus a silly monkey one I made up at the same time. Leave a long enough tail to be able to sew your cookie applique on to your project once fully assembled in finishing stages. Put to side until needed for assembly. Before you cut your yarn, make sure you leave a long enough tail to be able to sew your eyes on to the cookie applique. Cut yarn, pull through and put to side until needed during assembly. Row 1: Ch 6. Place 1 sc in 2nd ch from hook, (1 hdc, 1 dc) in next st, 2 dc in next st, (1 dc, 1 hdc) in following st, 1 sc in last st, sl st into base of last st.
Make sure you leave a long enough tail to be able to sew your mouth on your cookie during assembly before cutting yarn and pull through. Place to side until needed in assembly. Ch 4 and sl st in the last ch from hook. Leave a yarn tail long enough to secure to cookie in assembly, cut yarn and pull through. Place to side. Ch 3 and sl st in to the last ch from the hook. Leave a yarn tail long enough to secure to cookie in assembly, cut yarn and pull through. Place to side. 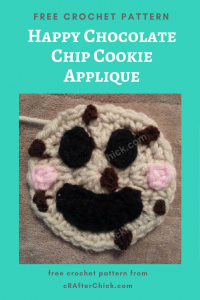 Repeat for the rest of the chocolate chips you desire for your cookie applique. Taking the tail left on your cookie’s mouth and your yarn needle, sew your mouth in to desired place on your applique. You can reference my picture on how I placed the mouth on my cookie. Once secure, pull yarn to back of cookie base and fasten off. Now taking the tail from one eye and your yarn needle, secure it in desired location on cookie base. Once sewn on, pull yarn to back of applique and fasten off. Repeat process for second eye. Now taking the tail from one blush circle and your yarn needle, secure it in desired location on cookie base. Once sewn on, pull yarn to back of applique and fasten off. Repeat process for second blush circle. Now taking the tail from one chip and your yarn needle or a small tipped crochet hook to pull through, secure it in desired location on cookie base. Once sewn on, pull yarn to back of applique and fasten off. Repeat process for the rest of your chocolate chips. Once completed you should have one long tail left on your project in the color of your cookie base. If you find any others, take the time to fasten them off now. When you are ready to attach your completed applique to your project, just use your yarn needle and tail to stitch it into place. Once secure, pull yarn to back of project your are attaching it to and fasten off. All done! 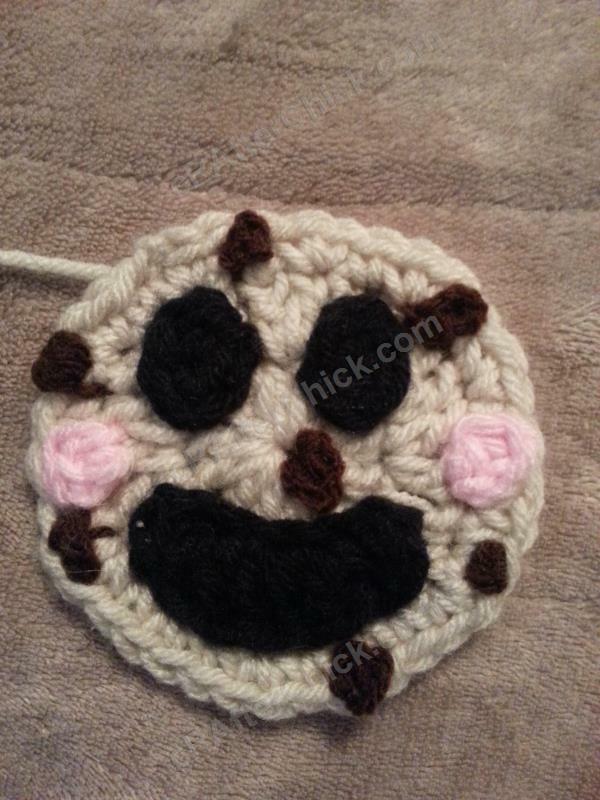 One cute and happy chibi chocolate chip applique. Now what to put it on? Decisions. Decisions. All the cRAfterChick patterns shared on this site are free of charge. Please feel free to use them to make your own items. If you use it to make items to sell please credit cRAfterChick for the pattern and provide link to our site. Please do not copy and paste my pattern or try to use my images as your own. You can link to any of my patterns. Happy crafting!